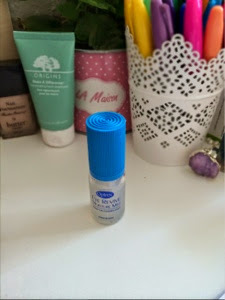 A quick little review for you today, I was sent this Optrex Eye Revive Moisture Mist by BzzAgent a couple of months back and when I received it, I didn't really think much of it, I thought it seemed a bit gimicky and that it couldn't really do anything that regular eye drops couldn't do but I've been using it non stop for the past few months and it's been really brilliant. As both a contact lens wearer and a hayfever sufferer this has been a bit of a god send during this spring heatwave that we've been having here in the UK, I simply spray this over each eye and leave to settle for a few seconds and within a minute or so, my eyes feel soothed, refreshed and revived. I also tend to use this after a long day in the office or travelling back from work to perk my eyes up, I wear my contacts most days and can leave the house at around 7am and not return until around 8pm so this really helps as my contact lenses tend to feel quite dry and gritty in my eyes after about 8 hours and this really eases that. It also helps when my hayfever starts to kick in, it doesn't obviously cure the itchy dry symptoms, but it does help to ease those symptoms when I'm out and about. I've really loved using this and will definitely re-purchase, another bonus is that this has a much longer expiry date, most eye drops have to be used thrown away after a month because of potential infections but I believe this can be used up until the expiry date on the bottle (mine has an expiry date of 2016) so although it's not the cheapest, I actually find it's cheaper than buying the eye drops because I don't need to re-purchase every month. You can find it here for £15.99 (or in most chemists) but Boots have buy one get one 1/2 price on selected healthcare at the minute.